The BC Used Oil Management Association and Grey Vancouver would like to thank M&R Environmental Ltd. for generously hosting the antifreeze launch event on July 4th 2011. The attendance of industry partners and various members of the media is a testament to the strength of BCUOMA and the need for an antifreeze recycling program in BC. 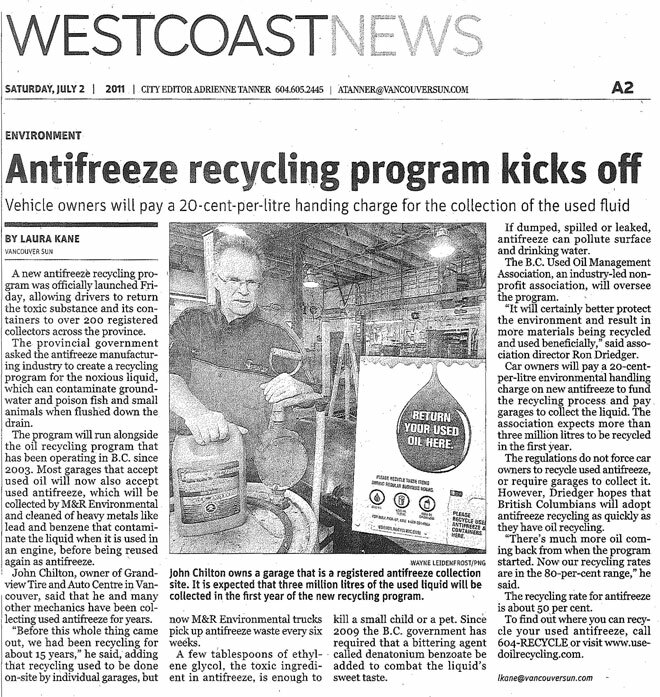 This launch event, along with the ongoing ambassador program, is providing British Columbians with the communication and education to properly dispose of antifreeze materials. Broadcasted media coverage of the launch event is helping BCUOMA implement its inaugural year for antifreeze recycling by expanding the number of return collection facilities that officially accept antifreeze materials and achieving return collection rate goals. The only problem? We already own the trademarks. 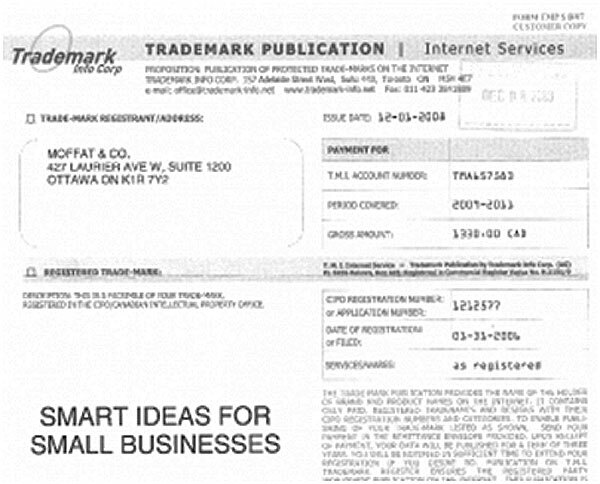 And we didn’t contract with Trademark Info Corp for any services. 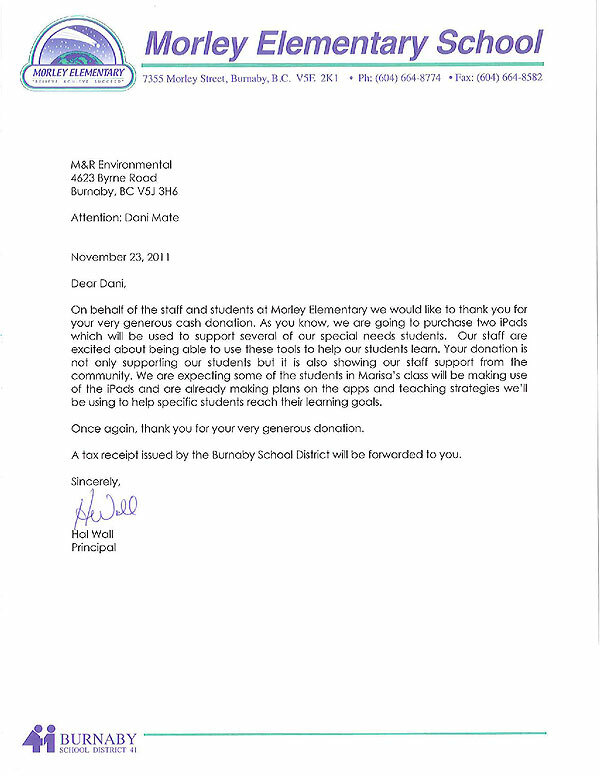 And we didn’t owe them any money. Scam! Apparently this scam has been rearing its ugly head for years – just take a look at the comments on the Excess Copyright blog. … just ignore it. Or use it as toilet paper, or even better to start a campfire. Or, if you’re feeling truly civic-minded and you have a few extra minutes, take the time to report it to your local police. But whatever you do, don’t pay it! You’re only feeding the troll, and losing money to a very long-running scam. Nick Heidfeld signing some souvenir mini race helmets. Famous faces in the Lotus Renault suite......Colin and Rihanna. Sir Richard Branson.....with a few of his friends! 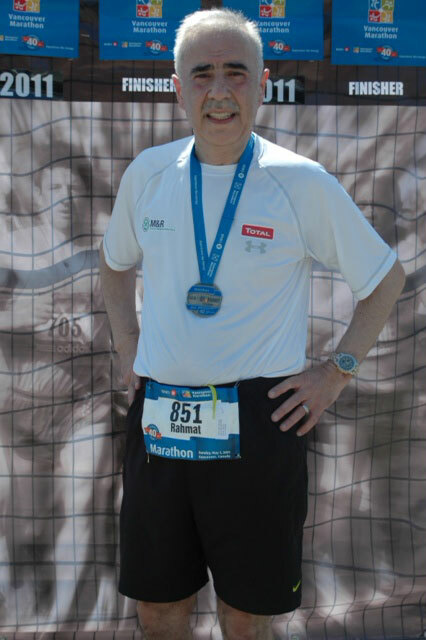 The M&R team would like to congratulate Rahmat on completing the 2011 Vancouver Marathon. APNA TRUCK SHOW 2011 to display our products. Your esteemed presence would be an honor. 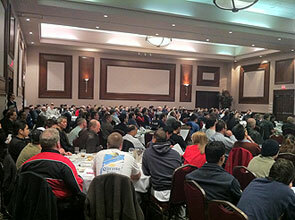 For the first time ever, Kevin McCartney conducted one of his Fundamentals of Lubrication seminars in the Vancouver area. 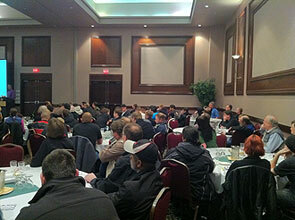 Over 300 hundred installers, fast lube operators and parts store personnel were in attendance. 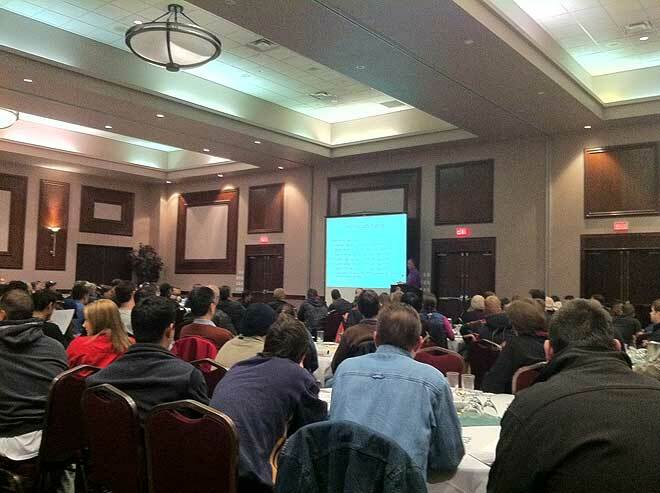 The main ballroom of the Executive Plaza Hotel on North Rd in Coquitlam was filled to its capacity….nearly standing room only in fact. Kevin spoke for just over two hours and provided those in attendance with an abundance of insight, understanding and knowledge regarding motor oils. The evening was such a success and the need in our industry locally for more of this kind of training, there is no doubt that with over 5000 accounts and a room with the capacity of just 300 M&R will bring Kevin back before the end of 2011 and will look for an even larger room to hold our next seminar. This is probably the most important class you’ll take this year! 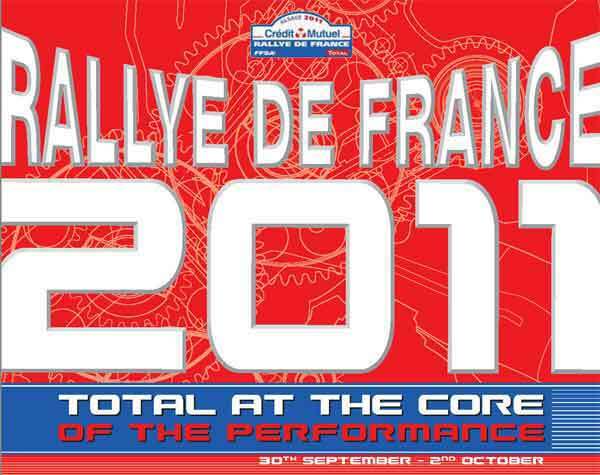 It will surprise and shock even the most experienced technicians and shop owners! Cost: In advance, $10.00 at the door $15.00 and includes dinner! Most oil fails to meet the OEM requirements of many cars you service! This has already caused hundreds of millions of dollars in engine damage. Damage that occurs when a thin SAE 5W-30 is substituted for a required thick SAE 5W-30. The realities of extended oil drain intervals and oil monitor systems. The realities of modern engine design and oil requirements. The claim “Exceeds all GM 4718M engine protection requirements” actually means that the oil product failed GM 4718M approval and should not be used in specific GM vehicles. The myths and realities of additive prohibitions and camshaft wear. Some SAE 5W-30 are required to be thinner/thicker than other SAE 5W-30 products. Mercedes Benz 229.1, 229.3, 229.31, 229.5, 229.51 oil service ratings. Kevin has worked in the automotive industry since 1974 as a Technician, Supervisor, Manager, Engineer, Trainer, Technical Writer and Editor. He has pioneered real world diagnostic techniques for OEM and independent technicians. Kevin frequently includes bonus information before the regular class starts, about special interest service topics. SO GET TO THE CLASS EARLY!